All homes currently listed for sale in the zip code 85050 as of 04/23/2019 are shown below. You can change the search criteria at any time by pressing the 'Change Search' button below. "Own the whole cul-de-sac with this one of a kind, stunning home. Surrounded by an amazing park, Club House with indoor Gym, basketball, tennis, and community events. Too many upgrades to list all! 6 beds + den + Movie room/Game room and study.The home features a very unique floating outside dining room must see to believe!" "DRAMATIC ''GONE WITH THE WIND'' STAIRCASE IN THIS AMAZING LUXURY ESTATE FABULOUS MIRADOR MODEL IN VILLAGES AT AVIANO!! ALMOST ALL THE CONTRUCTION OPTIONS WERE INCLUDED! BASEMENT HAS 2 FULL BATHROOMS, 2 BEDROOMS, 1 THEATER WITH BUILT UP ELEVATED PLATFORMS, AND 1 GAME ROOM! KITCHEN HAS NEWLY FINISHED CABINETS, BACKSPLASH AND GRANITE, STAINLESS STEEL GE PROFILE AND MONOGRAM APPLIANCES, GAS RANGE AND DOUBLE OVEN. FLOORING HAS 6'' HALLMARK DARK WOOD ENGINERED HARD WOOD IN MOST OF THE MAIN LEVEL. MAS"
"TOP OF THE LINE REMODEL! Designer's own residence elegantly and extensively remodeled with no expanse spared. 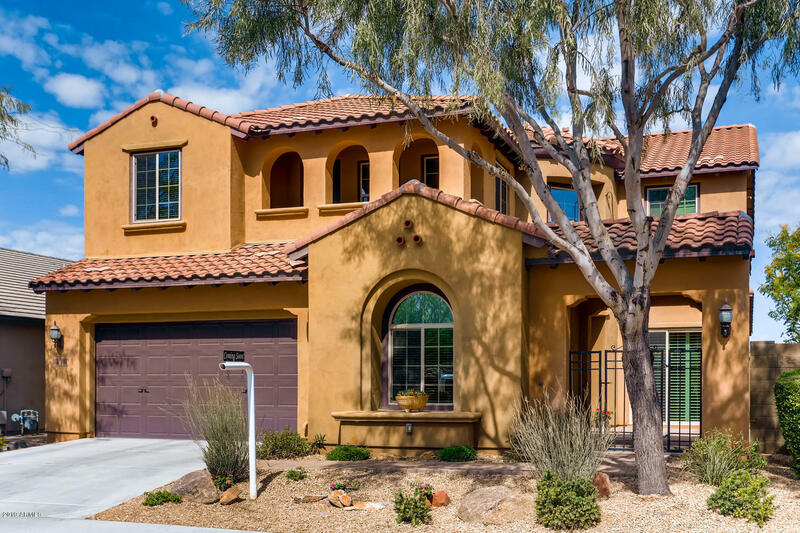 An opportunity to own a move-in-ready home with the finest finishes in sought after Aviano At Desert Ridge. Best of Toll Brother's floor plans the Venado. Oversized lot. 4 spacious light and airy bedrooms including a guest casita with its own separate entrance, plus an executive's office. 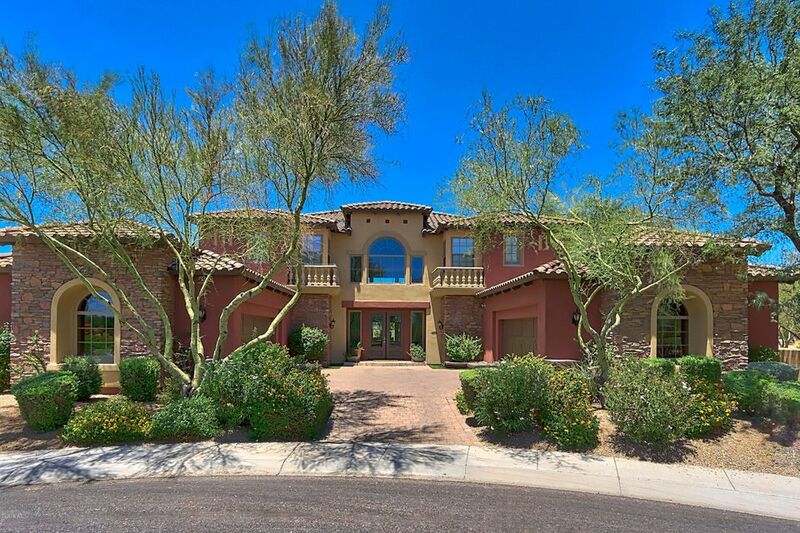 4.5 Bathrooms, 3 car garage, and privately gated with a luxurious custom iron gate. 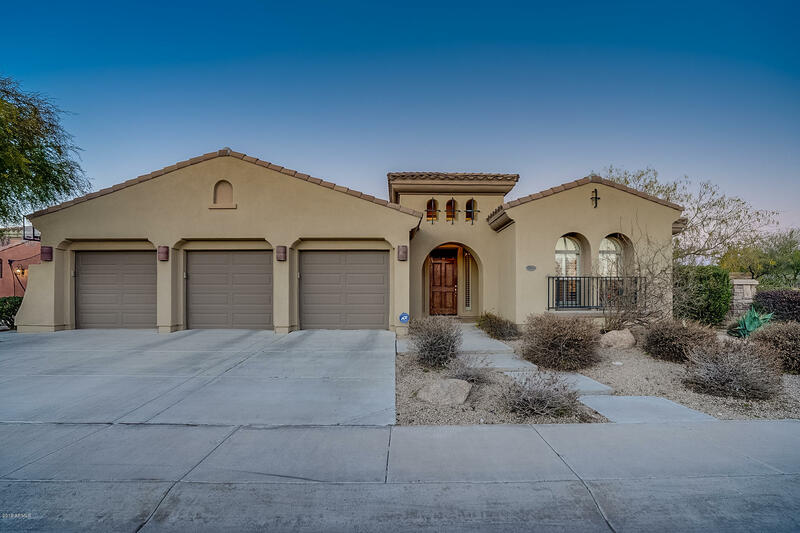 No interior step"
"Embraced by a beautiful desert setting in the amenity-rich Village at Aviano comes this sprawling 5 Bed/4.5 Bath Toll Brothers home of 5,687 sq/ft, whose majestic beauty is mirrored only by its incredible surroundings. Positioned on a prestigious residential street, 3719 E Louise Dr is a 0.37 Acre estate at once sets the mood for large scale living with incredible alfresco paradise comprising an exquisite outdoor fireplace, built-in BBQ, lush lawns and stunning custom pool with Baja sunning shel"
"NEW WINDOWS, NEW PAINT (inside and out), Refinished NEW FLOORS, Totally Turn Key -- Arguably the best model in all of Aviano, on one of the best private lots in the community. Fantastic double staircase, Mirador model, with a 20' tall entrance hall, upgraded with NEW counters, NEW contemporary fixtures, and neutral finishes throughout. A 30' long master suite that removed the walls for a separate sitting area, an enclosed media room loft, custom iron and glass front doors, 5 large bedrooms, and "
"HERE IS YOUR RESORT LIVING WITHOUT EVER LEAVING THE HOUSE! WALK THROUGH THE FRONT DOORS TO GRAND LIVING. 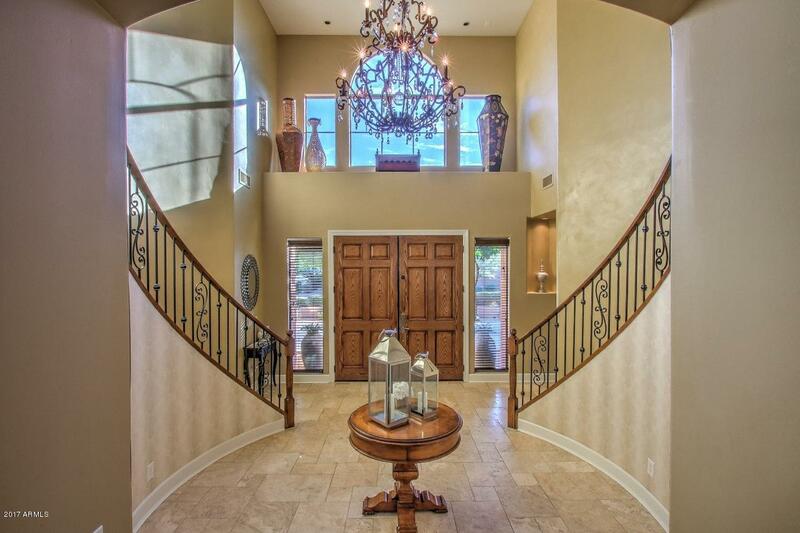 HUGE FOYER WITH DOUBLE STAIRWAYS TO THE 2ND LEVEL. OPEN FLOORPLAN WITH VIEWS TO THE BACK FROM FAMILY ROOM , DINING AND FORMAL LIVING ROOM. 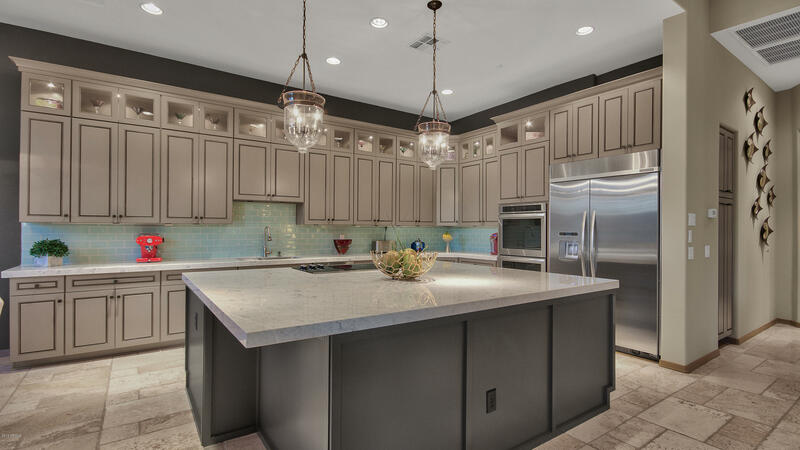 ISLAND KITCHEN PLUS BREAKFAST AREA WHICH LEADS TO THE FAMILY ROOM WITH BUILT IN BOOKSHELVES, STEREO AND TV WITH WALKOUT TO THE AWESOME BACKYARD. 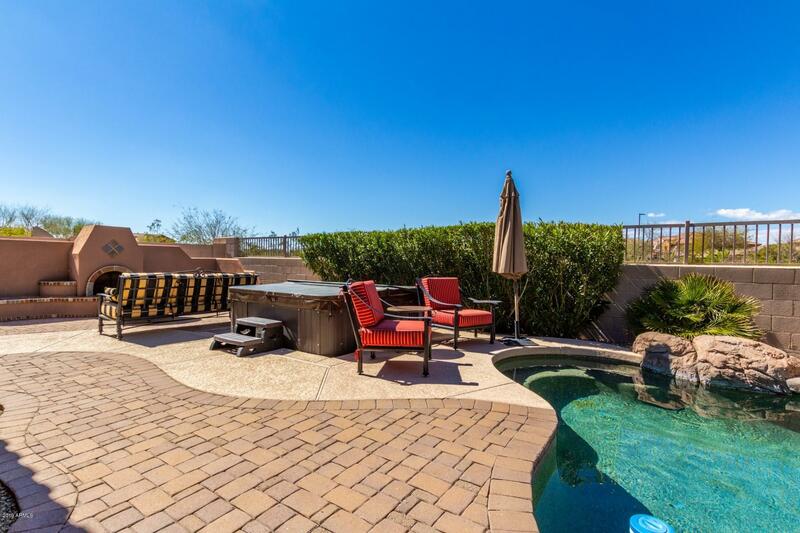 THE BACKYARD FEATURES A CUSTOM PRIVATE POOL, BUILT IN BBQ AREA, SEPARATE FIREPIT AREA ALL PERFECTLY PLACED TO "
"This home is an absolute MUST see. From the floor to the ceilings, from the front door to the lot line, everything has been upgraded. This beautiful home sits on a premium lot with no neighbors across and no direct neighbors behind. Enter the home through stunning Iron Gates and Doors to find a custom designed Rotunda with beams. The kitchen was upgraded to ''Chef'' options which include the 5 burner stove, large island, upgraded cabinets with molding, extra cabinets in eating area and desk spac"
"Why buy new when you can buy this 2 year new home in a gorgeous, private neighborhood allowing you to move right in and live in peace without the noisy, dusty construction around you and a home that is done inside and out. Just bring your furniture and start enjoying your new life in this amazing neighborhood. 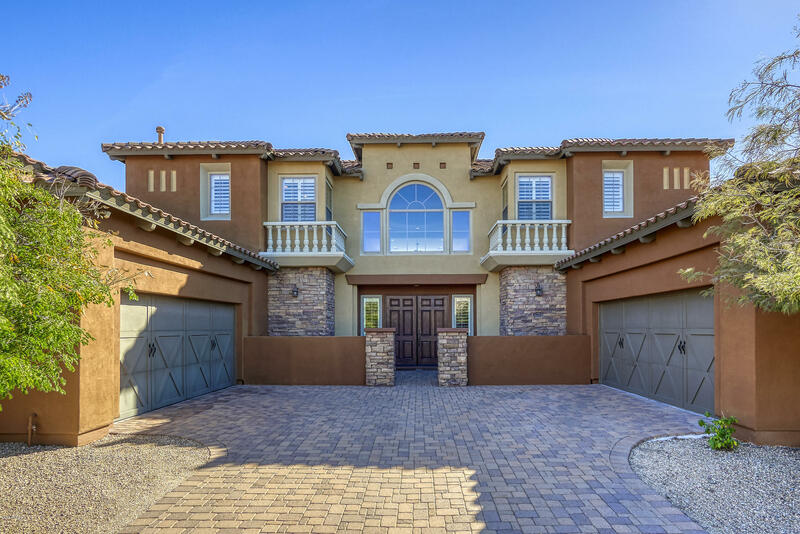 This stunning 5 bedrooms, 5 baths home in the gated Sanctuary community is situated on a large lot with a sparkling pebble tech pool and a big artificial turf area for those yard games or "
"Completed December 2017 this fabulous 4 bed plus office and loft, 3.5 bath is completely move-in ready. N/S exposure and steps away from the park! Endless features include wood plank tile flooring, whole house RO system, custom two-tone paint, smart thermostats, stainless GE Cafe appliances, gas cooktop, white soft close cabinets and drawers, upgraded quartz counters and breakfast bar. Extended 10 foot sliding glass door opens the great room to the covered patio, perfect for entertaining. 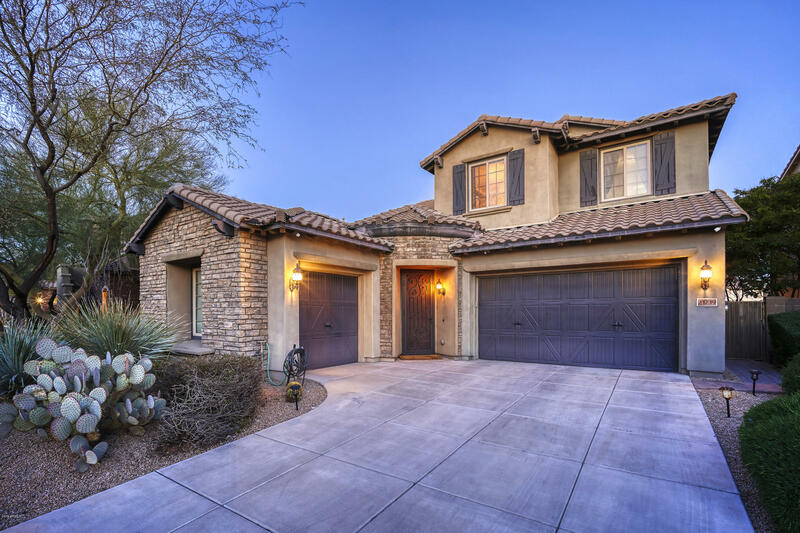 Privat"
"Gorgeous 5 bed+office, 3.5 bath, 3 car garage home in desired Aviano at Desert Ridge, featuring formal living & dining room, spacious gourmet kitchen w/ breakfast bar & nook, SS appliances & gas cooktop, all opening up to the family room w/ gas fireplace. Master bed on main level w/ private backyard entry & ensuite w/ separate shower/tub, dual sinks & walk in closets. Upstairs you'll find loft/game area, as well as large addt'l beds & baths. You'll love the backyard oasis w/ sparkling heated poo"
"You do not want to miss this stunning home in the coveted Aviano community. 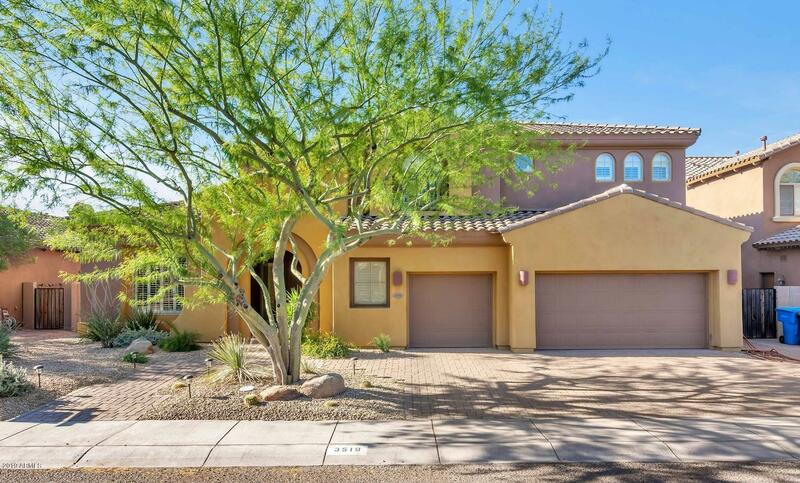 This 5 bd, 4.5 ba home boosts a large eat in kitchen with double ovens, gas range stove, large kitchen island, built in refrigerator, and a walk in pantry. Open floor plan flows into the living room which features shiplap walls with white brick fireplace. Formal dining, den/office, butlers closet, and play area/formal living are all downstairs. 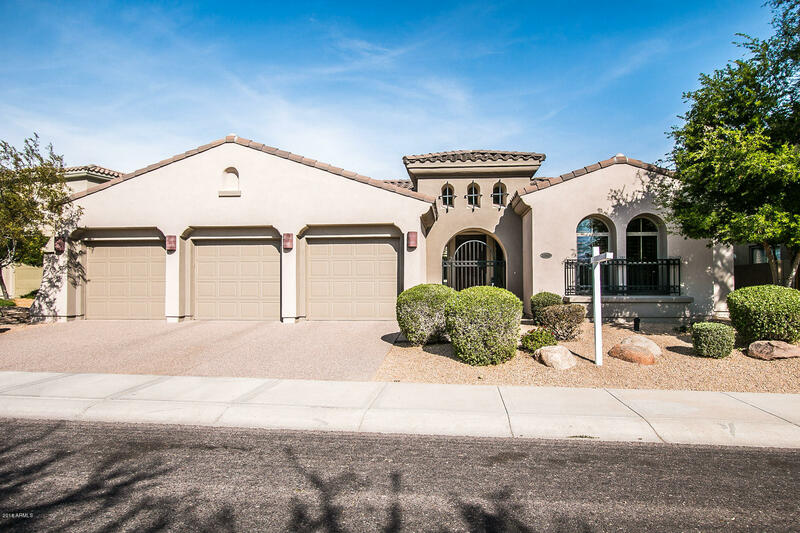 Over sized master bedroom has private balcony where you can enjoy mountain vi"
"Move-in ready home w/ over $150,000 in upgrades (after move in) located in Sanctuary at Desert Ridge. Endless features include 18'' ceramic tile flooring, Honeywell thermostat, dual AC units w/ 5 zones, 2 car garage w/ built-in racks, private travertine courtyard, prime North/South exposed lot, water filtration system, custom paint throughout, high-end window coverings, & spacious den w/ built-in desk & level 3 granite. 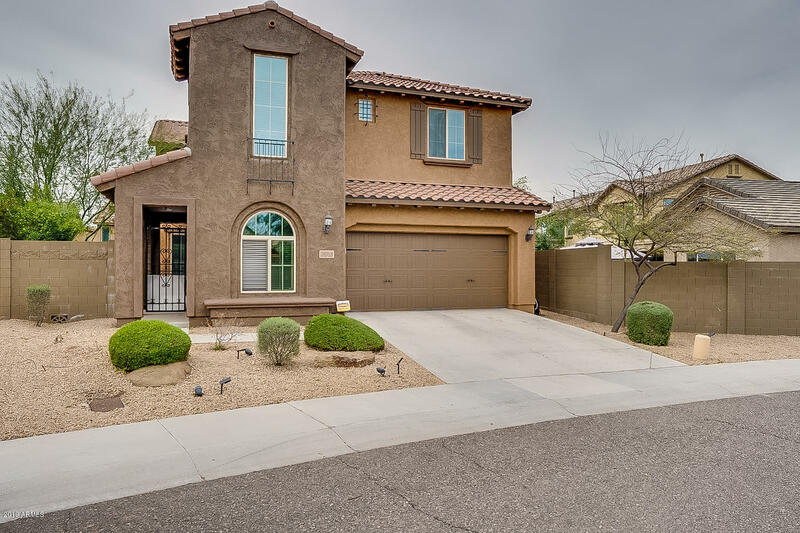 Gourmet eat-in kitchen has everything you need w/ extended shaker style cabi"
"Gorgeous, lightly lived in 4 bedroom home on large, 9400 sq ft lot in Fireside at Desert Ridge is ready for entertaining & fun! The original owners have made so many upgrades including a natural gas heated play pool, professional landscaping, natural gas fire pit, barbecue/bar with plenty of seating for family & friends. Panoramic doors in living room bring the outdoors in by opening to a covered patio with retractable awning. Huge backyard with lots of room to play. 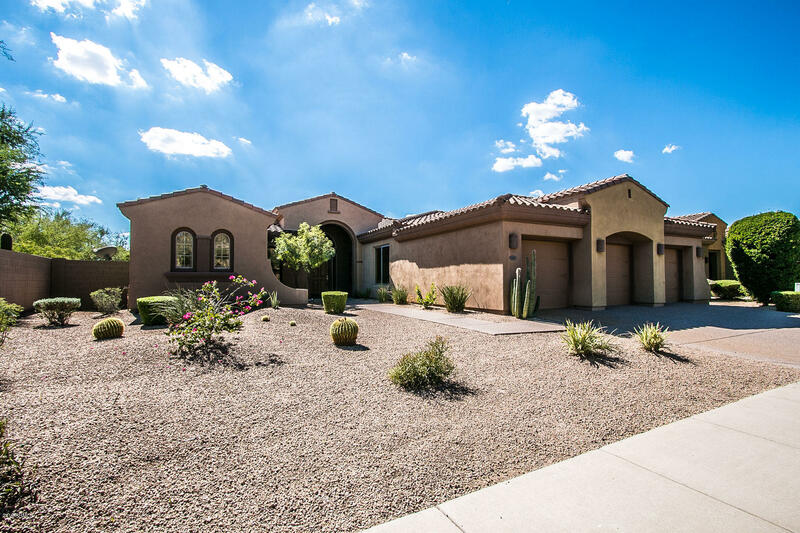 Spacious full master bedroom"
"Rare and in high demand, this former model is a stunning Saguaro plan in the heart of Fireside. Loaded with incredible luxury features including dual master suites, a huge bonus loft, interior courtyard with fireplace plus a resort style backyard with a gorgeous play pool, huge covered patio and open space behind. The gourmet kitchen is a chef's delight with high end appliances, slab granite counter, huge pantry plus a butler's pantry, all open to the stunning great room with custom media wall a"
"Blocks away from busy school pick-up & drop-offs, this ESCALANTE model sits on a premium lot that backs to beautiful desert NAOS land that can never be built on. With no neighbors behind you, you can enjoy the private backyard pool, waterfall, hot-tub and fireplace. 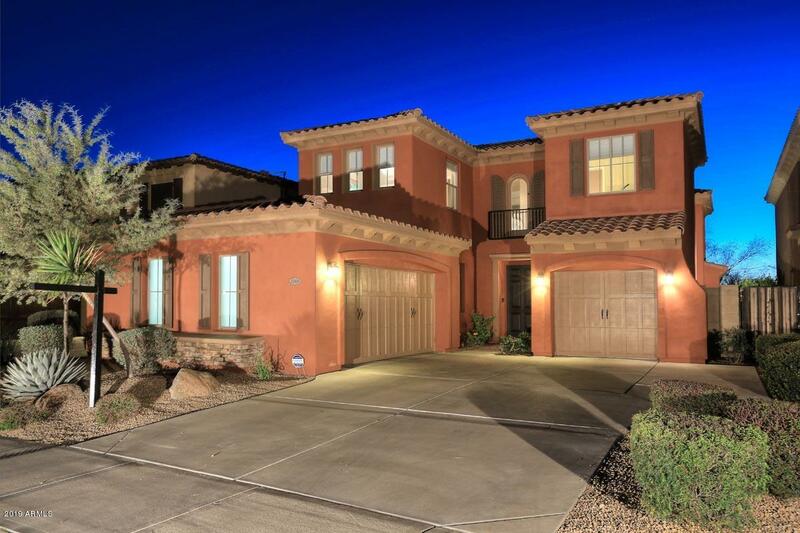 This one-level 4-bed home features a split floor-plan and 3-car garage. Situated in the prestigious community of Aviano that offers community and fitness centers, pool, tennis courts and several neighborhood parks. 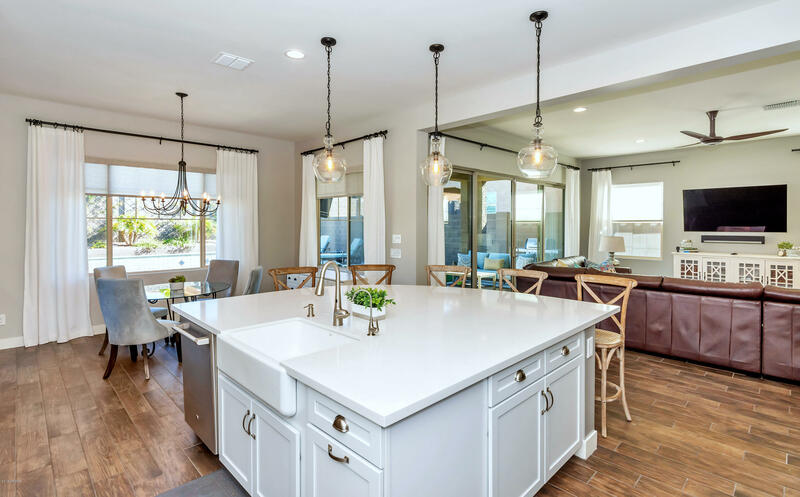 Aviano is loca"
"Fireside @ Desert Ridge is an award winning master planned community with clubhouse amenities offering residents a stylish suburban lifestyle with big city quality dining and shopping at the nearest intersection. 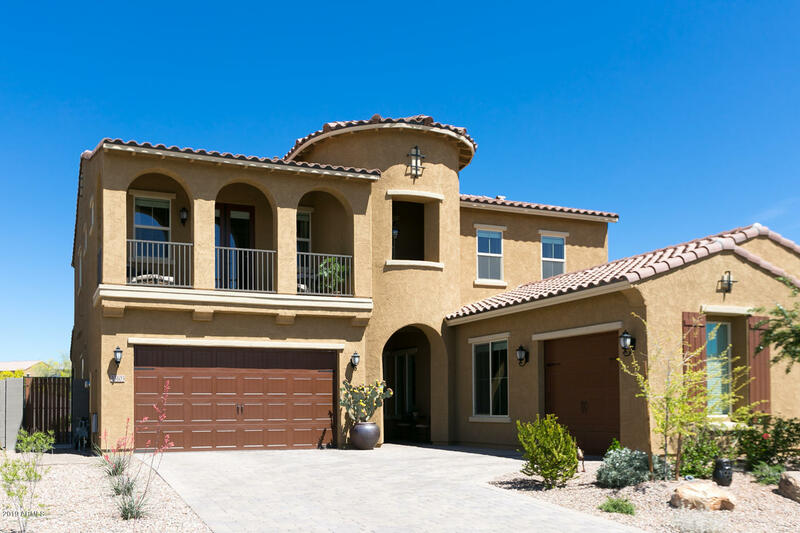 This limited edition 2 story Fuego model is positioned for optimum privacy with a corner lot & no rear neighbors. A sleek design Shasta pool, tumbled travertine decking and patio, easy care turf, a built in BBQ with dual sinks fridge make both entertaining and R&R at home a cinch. 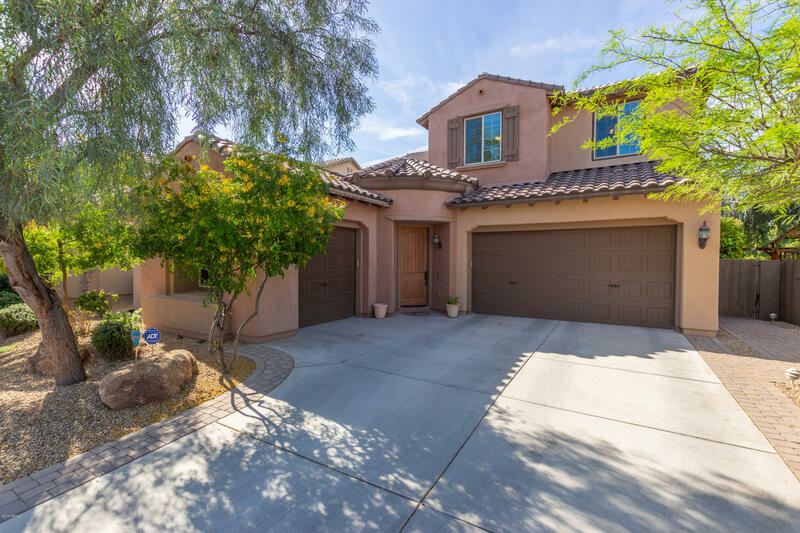 The i"
"This spacious home is now available in highly sought after Aviano at Desert Ridge. 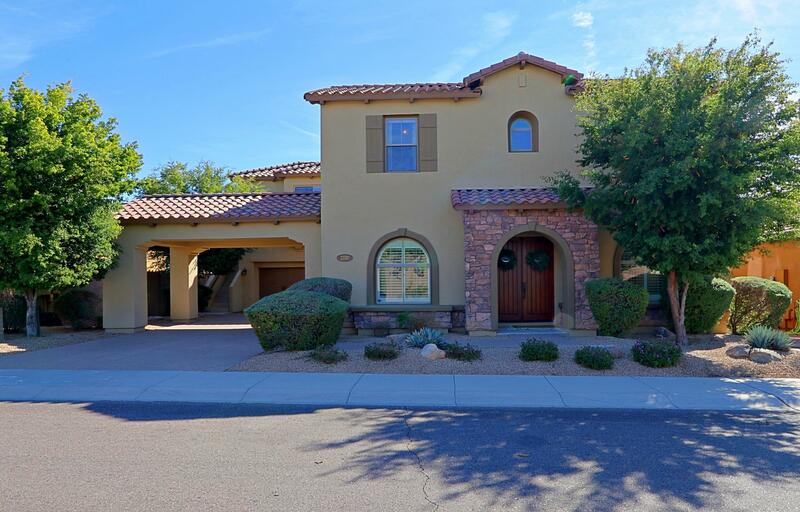 This home features a desirable open floor plan with office/den, loft, and media room. Warm custom paint through out. Upgraded gourmet kitchen with granite counters with gas cooktop. The home features a large back yard with built-in BBQ and gas fire pit perfect for entertaining. The community offers luxurious amenities including a community pool/spa, workout facility, tennis courts, and meeting rooms. 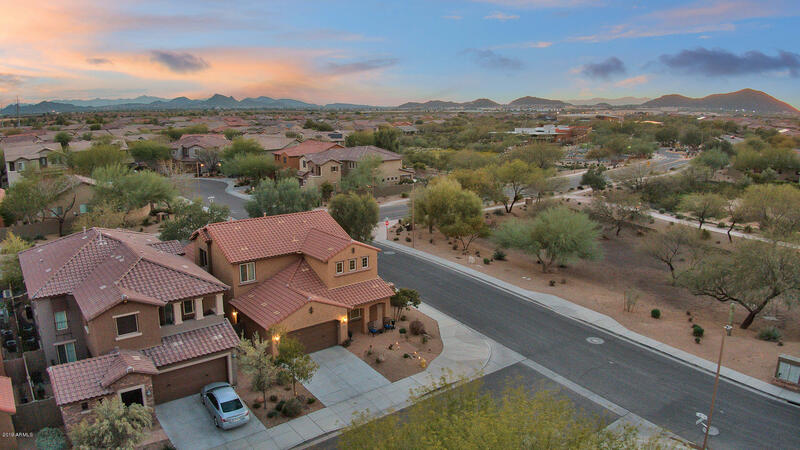 You will not "
"This rare, oversized lot is perfectly located within the award winning community of Fireside at Desert Ridge. This popular great room floor plan is well known for being beautiful and functional, with a downstairs guest retreat. This home was tastefully upgraded with glazed maple cabinets, stainless double ovens, built-in microwave, 48'' built-in refrigerator and golden ridge granite countertops. The master retreat is one to remember with it's private sitting room and step up soaking tub with mou"
"Spacious single level + BASEMENT, open floor plan with enclosed private courtyard. Quiet interior lot with no neighbors behind. Upgrades include alder cabinets, slab granite kitchen, stainless appliances, gas cook top, beverage cooler. Solid core doors, 5in basebrds, courtyard with fireplace and limestone pavers. All tile throughout, wood floors in 3bdrms. Mstr bath with 2 raised vanities, 2 w/i closets and enlarged shower (no tub). Backyard with pebble pool, waterfall, synth grass, partial v"
"***steal this house, best deal in Aviano **, corner lot, one of the best lots , privacy lot, no neighbors can see in backyard, original owners,slab granite counters/backsplash,stainless appliances ,brand new built in 48'' fridge,gas cook top & double ovens makes this a great Chef's kitchen for entertaining, custom stained plantation shutters,3-way stack stone fireplace,designer lighting, two-tone paint, high polished travertine flooring throughout w/ plush carpet in the bedrooms. master has walk"
"Absolutely gorgeous! Ideally situated on the corner the largest lot in the subdivision with RV gate to the south and private patio entrance to the north. The stunning backyard entertaining space, w/125K in upgrades backs to community open space, has been fully upgraded with extended travertine decking around the sparkling pebble tec playpool, elevated spa w/stacked stone finishes, waterfall feature and dazzling fire pits. 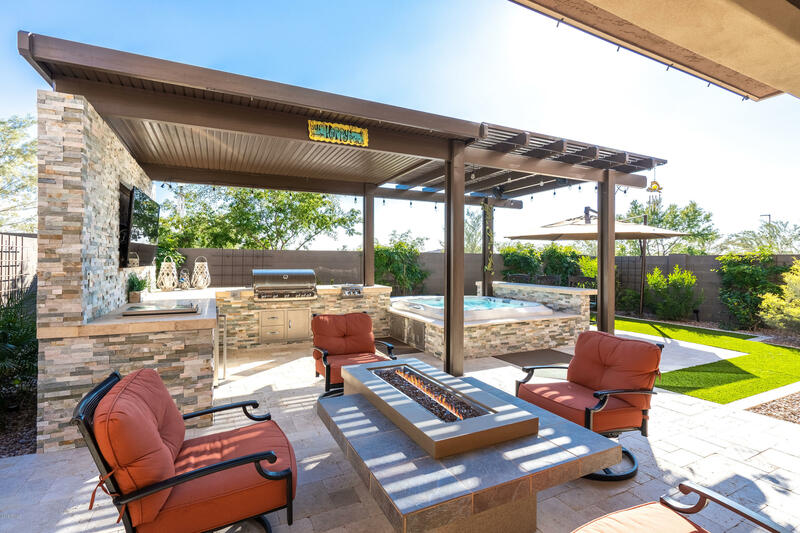 Custom pergola for outside fun or feast by the built-in bbq and traverti"
"Wonderful Fireside home that features 4 bedrooms + den + loft, 4.5 baths, and Guest Casita. 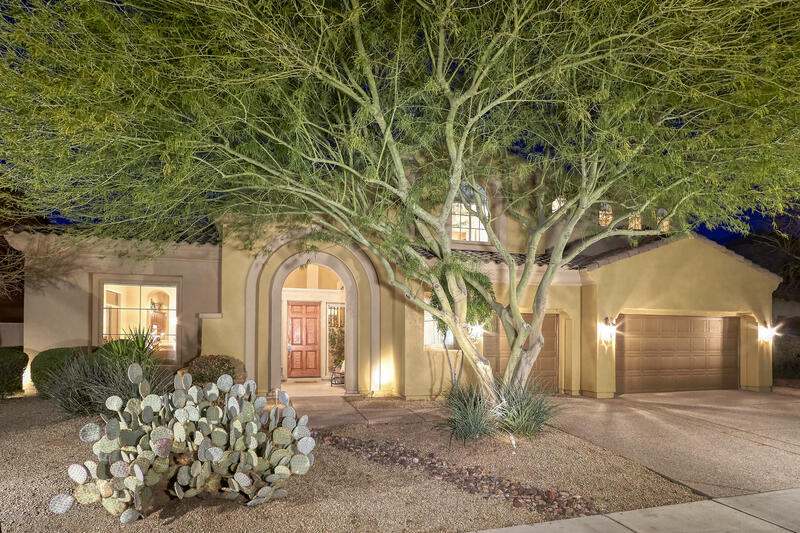 Lovely courtyard entry with soaring 18' ceilings and spiral staircase lead to open concept great room with large extended kitchen gorgeous granite counters w/SS appliances and a huge center island perfect for entertaining. Formal dining and & main office/den is just perfect! 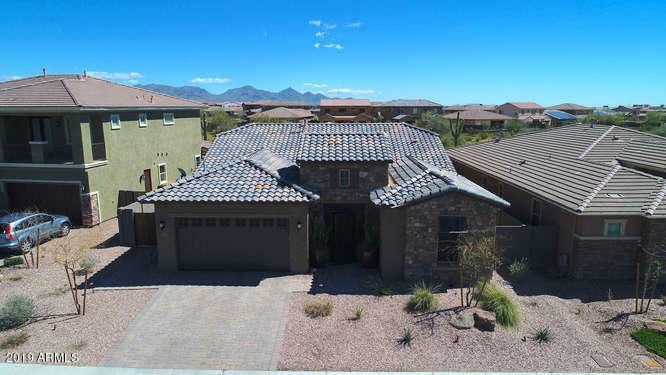 Large open loft leads to the oversized master retreat that features private sitting area, separate shower with a large garden tub,"
"Stunning home in the highly desirable neighborhood of Aviano. Upgraded Savino floor plan by Toll Brothers. Warm neutral paint tones throughout. 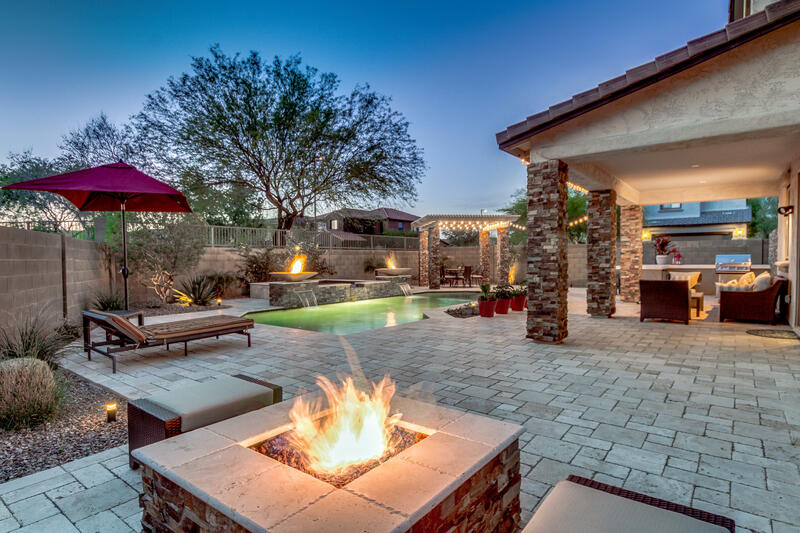 Center courtyard with custom pavers creates the ultimate outdoor living space for entertaining. Open living area with fireplace. Kitchen boasts cherry cabinets, granite counters, SS appliances, gas cook top & breakfast nook. Natural light enters through courtyard & exterior windows brightening the home. Split floor plan. Master suite offers a large sitti"
"Unique location and views in the highly desirable community of Aviano at Desert Ridge! Not only do you have open grassy area and views from your backyard with NO homes behind, you are steps away from 2 pocket parks, the Community Center, Aviano Park, and just a short walk to the elementary and middle schools- all while living in this gorgeous, upgraded Toll Brothers home! This La Bella model even has a bedroom and full bathroom downstairs! Upstairs there is also an additional enclosed room th"